Monday, September 2, 2013 is the first day you can pick up your tickets for My Choice, TIFF Choice, and individual ticket purchases. Go to the Festival Box Office (or if you are a TIFF Member, you can go to the appropriate TIFF Member box office) to pick up your tickets. 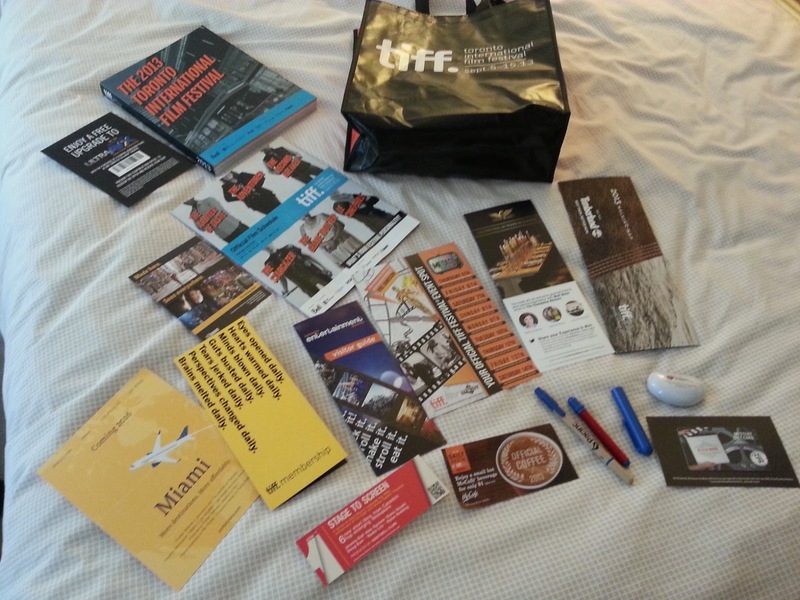 If you have a My Choice or TIFF Choice package, you will need your pickup vouchers, reservation #, photo ID, and the purchasing credit card for verification. Note if you used senior or student pricing you will likely also need those IDs as well. In practice, they may only check your voucher and photo ID, but I'd recommend having the other items as well to avoid any issues. If you lost your voucher, then according to the festival website, they can only be replaced in-person on September 2, and you will need the above items (minus the vouchers). If you want to exchange selections (provided your package allows it), you can also do those starting September 2 and up to 7:00 PM the evening before the screening you are exchanging. Note that not all package allow exchanges. If you are not doing any exchanges, I would recommend that you do not show up at the box office first thing on the 2nd, as people making exchanges will likely be there, and those usually take a long time, so you'll be waiting in line for nothing. If you bought a TIFF Choice package, you should receive an e-mail on September 2 outlining the films the festival has selected for you. If you purchased a Back-Half or Daytime package, your selection window will start on September 2. If you want to see which films are already off sale, you can go the site now for individual tickets and see which ones are unavailable. I've had a couple of requests to create a thread where people can post their experiences, or must-sees, or must-avoids for TIFF 2013, so I've added this page for just that purpose. Please feel free to add in the comments any films you liked or disliked, or anything about your experiences at this year's TIFF. But try to avoid any long-winded rants or anything like that: I reserve the right to prune the comments down especially if things start getting out of hand. I'll see how this page goes this year, and if it's successful, I'll try to do this again next year. Theatres are generally not right next door to one another, so be sure you leave yourself enough time. Public transit, especially the subway, is the best and fastest way to get around. Check out the Toronto Transit Commission's site at ttc.ca for information on fares, routes, closures, and service advisories. One important thing to note is that there are still nightly shutdowns of the Yonge subway between Eglinton and Finch stations every night (except Saturday). If you need to head north from downtown after a late film or Midnight Madness, keep in mind that you'll eventually be shunted onto shuttle buses. One other thing to note with the subway: on Sunday, it starts up significantly later, so check the schedule for those days. If you ask a question during Q&A after a film, keep it short and actually ask a question rather than just gushing; no one else wants to hear that. If you have your own tips for others, feel free to post them in the comments. Individual tickets go on sale to everyone tomorrow, Sunday, September 1, 2013 at 9:00 AM Eastern. If previous years are any indication, the online system will be heavily loaded down when ticket sales start. You may get lucky and get in right away, but more often than not you will be shunted into a "virtual waiting room" which features a countdown timer. Not sure if they'll change the way that works this year, but note in previous years, the countdown didn't actually mean anything; you wouldn't actually gain entry at the end of the countdown, it would just reset more often than not. You can also buy in person or by phone, but I've heard stories from other people who went in person that all the films they wanted were already off sale by the time they made it up to the counter. If you want an idea of which films are off sale (i.e. sold out, you can check the official off sale page, or you can check my post here: http://tifftalk.blogspot.ca/2013/08/tiff-2013-off-sale-sold-out-screenings.html, or you can check the tiffr page commenter 12amMovies posted based on comments to this blog. Many thanks to 12amMovies for posting and updating the tiffr page, and everyone who contributed off-sale screenings to the page. I know people who came later definitely appreciated the information. Since it will be difficult for people to login initially when individual sales start, if you do manage to get in and get a chance to see any additional off-sales, feel free to add them to my comment page: http://tifftalk.blogspot.ca/2013/08/tiff-2013-off-sale-sold-out-screenings.html. This post is a placeholder for people to add comments for any films that they notice as sold out (i.e. off sale) when completing the online ticketing process for My Choice packages for TIFF 2013. Feel free to post a comment for anything you see as sold out when you log in to make your picks to help others out. Selection of My Choice Regular Flex and Premium Flex packages begins tomorrow, Saturday, August 24, 2013. From August 24 to August 27, TIFF members will select their packages. From August 27 to August 30, the general public will select their packages. You should have received your start time from TIFF by e-mail by now; if not, contact the festival for help. Note that TIFF members generally select first in descending order of their level, followed by everyone else, who are each given a randomized start time. If you purchased a My Choice Back-Half or Daytime package, your selection window will be on September 2. If you purchased a TIFF Choice package, you will be e-mailed the movies selected by TIFF for you on August 31. For My Choice Regular Flex and Premium Flex package holders, you have from your assigned start time until August 30 at 7:00 PM Eastern to sign in and complete your selections. If you fail to log in during this period, you will have to wait until September 2 at 9:00 AM Eastern before you will be allowed to log in again. Note that the website will be down for maintenance between 1:00 AM and 4:00 AM every day. If you don't have internet access, you can also make your selections at the Festival Box Office or by phone, but only after your start time. Note that once you log in, you have a maximum of 1 hour after your first selection to make the remainder of your selections and check out. If you exit without checking out, your choices will not be saved and you will receive vouchers instead that can be redeemed for films later. If you don't use up your allotment of tickets, you will receive vouchers for the unused portion. Once you have logged in, you cannot log out and re-log in again at a later date; all your choices must be made during the same session. If you bought multiple packages, you will receive a separate login for each package. You will need to login separately for each package and make the selections independently. Your start times may or may not be different for each package, depending on when you bought them. I would recommend completing and Premium packages before Regular packages, as Premium tickets have a smaller inventory and sell out quicker. Before starting, make sure you have your username and password that you used when you signed in to the TIFF site to originally buy your packages, along with any package codes. If a screening is marked off-sale, it is sold out. But before you check out, go back and check the film again, as inventory may have be released by other people who changed their minds. If you encounter any error messages when filling out your order online, try clicking the By Schedule or By Title buttons; do not try to logout. When you check out, note any reservation number displayed to you. You should be e-mailed this number, but it's good to note it just in case. 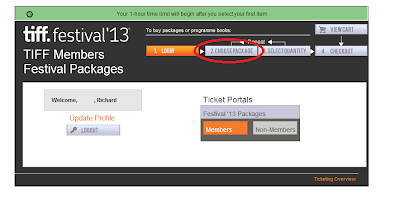 The How To links at the bottom of each page in this blog have been updated to reflect 2013 dates and the online ticketing selection process. If you have any questions feel free to add a comment to this post. Pick Up Vouchers are electronic this year. If you didn't print them out when you ordered online, or if you ordered over the phone or in-person, you will need to pick them up from the TIFF box office. Consult the TIFF website at http://tiff.net/thefestival/tickets/info for more info. The Cineplex at Yonge and Dundas is not being used this year. The Bloor Hot Docs Cinema, which is being used this year, is further away from the bulk of the other theatres, so plan your schedule carefully if you end up with a film here. Click the "2. CHOOSE PACKAGE" button at the top of the page (circled in red above), not the "Members" button to see the list of packages for purchase. When you checkout and complete your purchase, the site will pop up a window with your pick up vouchers, so turn off any pop-up blockers in your browser. Note, your vouchers are also e-mailed to you to the e-mail address you specified in your profile. The e-mail stated that they can't resend vouchers, so don't lose the e-mail, otherwise you'll have to go do in person to get them. I did see a bug where on the checkout screen, the line item price for 2 programme books I ordered was incorrect even though the grand total was fine. Purchase went through without any problem, though, and I got the correct number of vouchers. Speed is now back up as well; the portal was initially very, very slow. Just a reminder that ticket packages go on sale to TIFF Members starting Tuesday, June 25, 2013 at 10:00 AM Eastern time (all payment methods are accepted). Note debit and cash are not accepted for online sales. Non-members can purchase starting July 3, 2013 at 10:00 AM Eastern time, but only if paying by Visa. If you are a non-member that wants to pay by Amex, MasterCard, debit, or cash, you must wait until July 10, 2013 at 10:00 AM Eastern. Note debit and cash are not accepted for online sales. Your best bet is to use the online site at http://tiff.net/thefestival, but you can also call (416) 599-TIFF or 1-888-599-8433, or visit the TIFF Bell Lightbox at 350 King St W. Note that the TIFF Bell Lightbox only does sales from June 25 to August 19. Starting August 20 a special festival box office will open. Generally, most packages do not sell out with one exception; the Premium Flex Pack sold out the first day of Member sales last year. They released additional Premium packs the first day of sales to non-Members paying by Visa, but they sold out that same day. So if you want a Premium Flex Pack, I would recommend purchasing it as soon as possible. For all other packs you can buy at your leisure. The festival has released details on ticket packages for the 2013 Toronto International Film Festival, which is on from September 5 to 15, 2013. The Product List provides information on each ticket package and on single tickets, including a detailed breakdown of pricing. The Key Dates page provides important dates you should keep an eye on. Ticket Info has information about the ticketing process. FAQ has answers to frequently asked questions. I think prices are up very slightly; note this year they are including HST (provincial/federal sales tax) in their listed prices (but not the additional fees that may be tacked on). I think in previous years they had excluded HST and fees from the listed prices. There's no separate 10-ticket pack; it's been included in the "Regular Flex Pack", which allows you to by in increments of 10 tickets from 10 to 100. The Contemporary World Cinema TIFF Choice Pack is slightly different this year; you get extended Q&As with each of the 5 films. Note the Premium Flex Pack, Back-Half Pack, and Daytime Pack My Choice ticket packages each have two sizes; e.g. the Premium Flex Pack has one version with 6 tickets, and another version with 12. The Online system will be used again this year; Members have earlier windows for ticket purchase and selection as always, determine by their specific member level. For My Choice Packages, there is a limit of one package type per account; i.e. you can't buy 2 Daytime Packs; however, with these packages you can get 4 tickets per screening per account. Exchanges are allowed only prior to the day of screening. For TIFF Choice Packages, you can buy up to 4 per account; there doesn't appear to be a restriction on type; e.g. you could buy 2 Midnight Madness packages. No exchanges are allowed on tickets in these packages. August 31, 2013: At 9:00 AM, off-sale screenings (i.e. sold out screenings) will be posted at tiff.net. September 1, 2013: Single tickets go on sale to everyone at 9:00 AM ET. September 2, 2013: At 9:00 AM ET, My Choice ticket holders can pick up their tickets and make exchanges.